EzVision is a range of multi-line LED display boards. 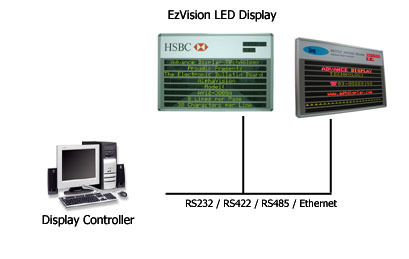 EzVision is meant for use as information displays at hotels and corporate lobbies, interest rates and foreign exchange displays for banks and financial centers, schedule information displays for airports, train stations and bus stations, etc. 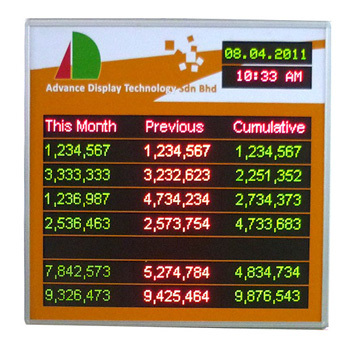 Each display consists of multiple lines of full matrix LED display modules. Generally, there are 8, 12 or 16 display lines per board. Each line can display up to 30 alphanumeric characters. The modular design allows for additional lines and characters per line to be included in the display board when necessary. The EzVision is designed for indoor installation. The display element employed is single color LED of red, yellow-green, or amber color. There are two types of character size, 1.2 inches and 2 inches character height. Graphical icons and special alphabets are supported. The display information is entered via computer. 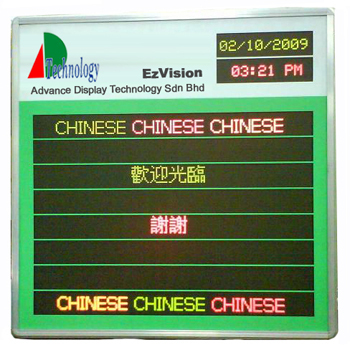 A display editor software is come standard for the display board. A number of display boards can be connected to a single computer via a RS422/485 network. Alternatively, in a LAN environment, the display network can be connected to the LAN via an Ethernet COM Server.